Renewable energy policy and discussion can get a little abstract. That’s why I’ve teamed up with Joe Deets, co-founder of Community Energy Solutions, to write this FAQ based on what we’re hearing from ordinary people as they consider installing solar panels on their rooftops. Savvy homeowners are beginning to shop around for something a little unexpected: energy. No longer strictly the purview of big utility companies or off-grid eccentrics, rooftop solar arrays are becoming more of a mainstream home improvement option for ordinary consumers. Though costs have come down, and state and federal incentives help sweeten the pot, a typical installation is still a five-figure affair ($15,000 – $30,000), roughly similar to buying a new car. “Shoppers” in this new market will want to proceed deliberately, do their homework, and not have to contend with a high-pressure pitch from some showroom salesman. And that’s precisely what’s so refreshing about what’s going on in some Seattle neighborhoods right now. The Go Solar Seattle Northwest campaign is a collaboration among two non-profit groups, Community Energy Solutions and Sustainable Ballard, a small local solar panel installation company, Sunergy Systems, and other key partners. And it’s hitting just the right note with homeowners who are curious about going solar. The campaign is primarily organized around four free workshops, presented on neutral ground at places like the Ballard Public Library and Phinney Neighborhood Center. At the two that I’ve attended so far, small groups of 20-30 program registrants listen attentively to a straightforward, factual, friendly presentation from Joe Deets of Community Energy Solutions and Howard Lamb of Sunergy. The audiences are ready with intelligent questions, and aren’t shy to ask them at any point during the 90-minute session: how quickly can I see a return on investment? How will this affect the integrity of my roof? What do I have to do to clean and maintain the modules? Indeed, the project dovetails seamlessly with the mission of Sustainable Ballard, which was originally formed in 2003 with energy independence as part of its core philosophy. In return for its grassroots expertise and neighborhood communications efforts, Heins said that the non-profit receives $150 for every sale. And rounding out the collaborative effort is Silicon Energy, a module manufacturing company in western Washington. Registrants may select from four different module manufacturers, but Stu Frothingham of Silicon Energy is always on hand at the workshops to answer questions, and may even invite you to hop up and down on the world’s most durable module! 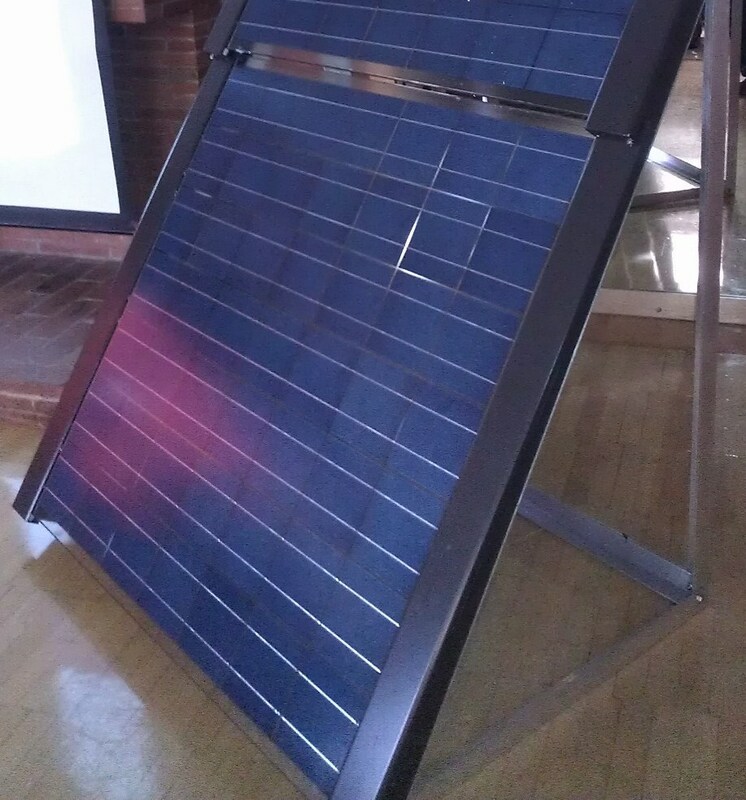 Silicon Energy module on display at one of the workshops. Though internationally the solar industry is robust and mature, here in the US it really does feel like an emerging sector, very small-scale still. For this reason, highly collaborative efforts such as the Go Solar Seattle Northwest campaign and others similar to it, may be exactly the right model for disseminating information and connecting small, local businesses to a potentially enthusiastic customer base.